The mower is attached to the front axle. As the axle pivots over dips and ridges, the mower automatically conforms to these irregularities. Rollers gauge the rear of the mower. Three interchangeable blades, with the leading blade placed ahead of the other two, give you an overlapping mowing- pattern. You get wider, more uniform cutting, and no timing is required because it's impossible for the blades to touch. The mowers are attached to the front axle and gauged by the front tractor wheels. This is a patented feature and is exclusive on Allis-Chalmers tractors. 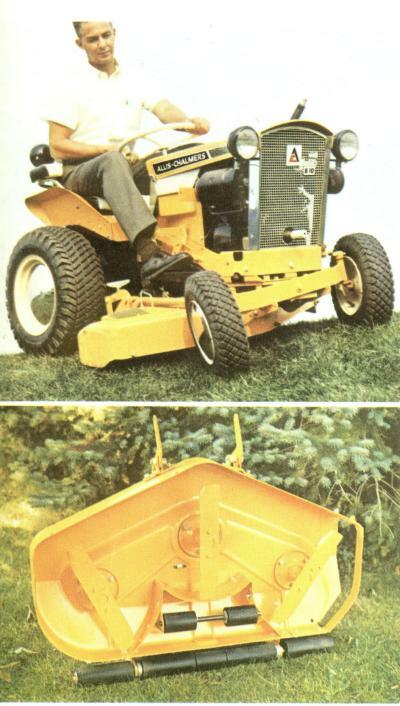 As the axle pivots over dips and ridges, the "no scalp mower" conforms to the irregularities. Rubber rollers on nylon bushings on the underside and' rear of the mower pan gauge the rear. Overlapping patterns of the three interchangeable blades provide Uniform cutting pattern. No blade timing is necessary. A spring loaded idler maintains proper tension on the blade spindle drive belt. The spindles have permanently lubricated bearings. The steel mower pan is 6-1/2" deep. This allows great amounts of cut material to be exhausted from under the pan without plugging the cutting blades. The PTO assembly has been raised and the mower bale assembly lowered for greater clearance of the mower drive belt.